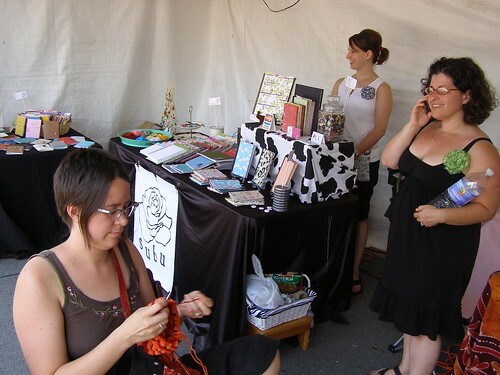 my friends emily, carrie, and i at the show (my booth is where this photo was taken from). the weather was beautiful. i saw the twirly girl bonnet from the book into the hands of someone who loved it. thanks to everyone who stopped by to say ‘hi.’ now, to re-open the shop, start packing up the house for the move, and apply to renegade chicago. yikes! This entry was posted in cosyknitsliterally, cosyspins, craftfairs by cosymakes. Bookmark the permalink. If you find yourself at Renegade in Chicago, please know you’re welcome to stay here! Good luck with all your endeavors! Man, you’ve got a full plate at the moment. Cosy, I also want to say that if you end up in Chicago, I will come and visit you! I will take any opportunity to see you when you are this close to me.